Vintage 1971 Woodstock toy is in great condition. 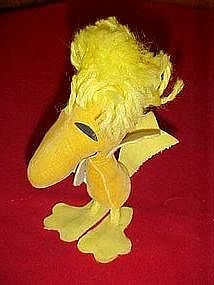 Made of a yellow velvet with yarn hair and stiffened felt feet.I believe it is sawdust filled. Measures total of 6" tall and is in great condition! A wonderful addition to your Peanuts collectibles.